Dreams Are Calling. : Feeling Young, Being Dumb. If you know me, then you'll know I'm a big fan of One Tree Hill. I have been since I was 13. It finsihed a couple of years ago *sniff* but it had a pretty impact on my life. That sounds strange right? A tv show had a big impact on my life? Well it did. It taught me alot. Basically helped me through high school and, so far, my 20's. It also introduced me to a ton of music. Two of the artists OTH introduced me to: Tyler Hilton and Kate Voegele. Sunday night saw them co-headline my favourite venue- Portsmouth Wedgewood Rooms. 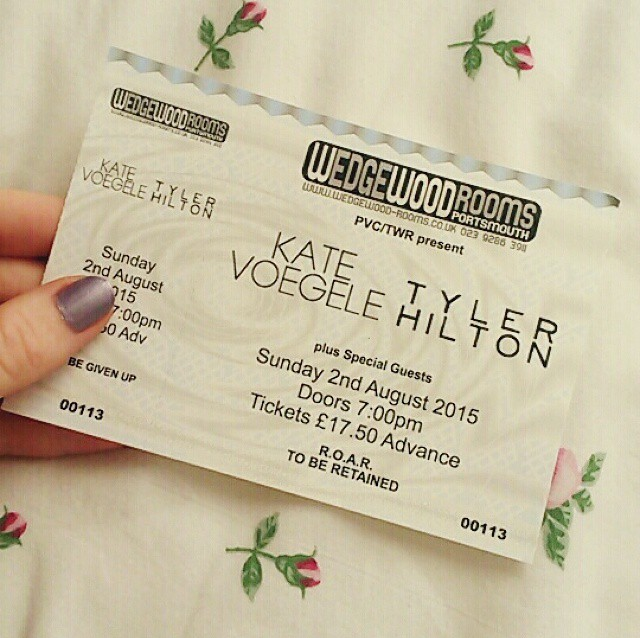 I actually saw Tyler Hilton headline there about 18 months ago now but I've never seen Kate live. Both of them we're perfect. Made conversations with random people in the crowd, played beautifully, made sure they met everyone, and were just genuinely lovely friendly people. Also, they played "When The Stars Go Blue". Which is a song Tyler sang on the show with one of the main characters, and well, I almost cried. I'll post some videos I took down below. If this is as close to a One Tree Hill reunion as I'm going to get, I think I'm okay with that.